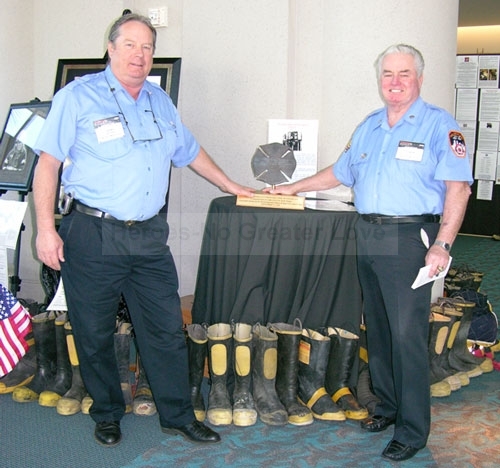 Jack Toale and Jerry Bresnan, FDNY Retirees of San Diego, California stand beside a piece of WTC Ground Zero steel crafted into a Maltese Cross with steel from Tower #1. Written upon the face of the cross are the numbers "5-5-5-5" in the center, surrounded by the words "World Trade Center", "Sept 11, 2001". The significance of the cross: "When a firefighter makes the ultimate sacrifice in the line of duty an alarm goes out, Signal 5-5-5-5,five rings in a series of four. Now our Brothers & Sisters have completed their task, their duties well done, the bell rings 20 times in memory of and tribute to their life and service." This cross was donated by Jack Toale, President of the 18th Division of FDNY Retirees. It will be presented to the City of NY on Sept 11, 2006 when the World Memorial and Release of Souls makes it's final appearance at the World Trade Center area.